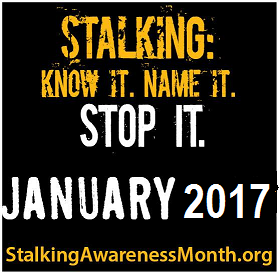 This January marks the 13th observance of National Stalking Awareness Month. The Stalking Resource Center (SRC) of the National Center for Victims of Crime partners with the U.S. Department of Justice’s Office on Violence Against Women (OVW) to bring resources and general awareness to the public about stalking every January. President Obama issued the 2016 proclamation and underscored the importance of standing “with victims of stalking” as well as bringing stalkers to justice and increasing efforts to remove stalkers from our schools, workplaces, and neighborhoods. The statistics on stalking are unsettling. Seven and a half million people are stalked in the United States alone each year, and one in six women will be stalked at some point in their lifetime. Furthermore, two-thirds of stalkers pursue their victims at least once per week, many daily, using more than one method. Technology, such as cell phones, GPS, email and social media, has increased the avenues stalkers can use to contact or “approach” their victims, which is why cyberstalking is on the rise. 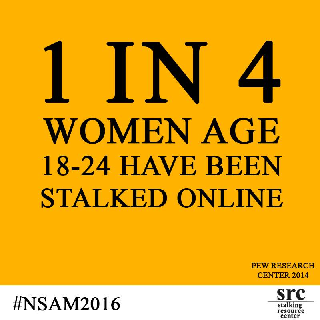 The SRC and OVW have developed a website dedicated to Stalking Awareness Month. It contains resources to help educational institutions, organizations, and other interested groups promote the month with a social media messaging calendar, sample news releases, web banners, posters, and more. In addition, there are fact sheets, quizzes, online courses, reports, brochures and guides for victims. For law enforcement and campus safety officials, specific resources are available such as Stalking: Problem-Oriented Guide for Policing (PDF), Creating an Effective Stalking Protocol (PDF), and detailed stalking legislation. The SRC and the California Coalition Against Sexual Assault also published a Model Campus Stalking Policy (PDF) in 2011, which was developed in direct response to colleges and universities looking for assistance on how to address stalking on campus. Stalking Resource Center – In 2000, the National Center for Victims of Crime partnered with the U.S. Department of Justice’s Office on Violence Against Women to create the Stalking Resource Center (SRC). 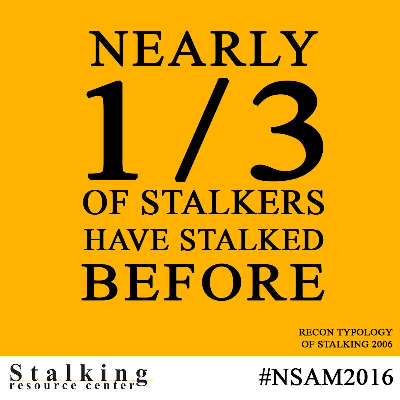 Since its inception, the SRC has trained over 100,000 professionals who work with victims in all 50 states, two US Territories, the District of Columbia, the United Kingdom, and Germany and provided technical assistance to hundreds of communities seeking to enhance their response to stalking. Office on Violence Against Women – The stalking subsection from the Office on Violence Against Women contains information for victims, prosecutors, law enforcement, advocates, judges, and community correction officers. Safe Horizon – The largest non-profit victim services agency in the United States, Safe Horizon provides tips for victims including tech safety, access to community programs, and a crime victims hotline.